Valiant comics have been gradually earning a small fanbase since their return in 2012, but in the last several months their line has skyrocketed to the top of the list of the most interesting independent comics publishers. This is largely due to the inclusion of some fantastic talents that have joined up in the Valiant Next initiative, including Matt Kindt, Jeff Lemire, Paolo Rivera, and more. 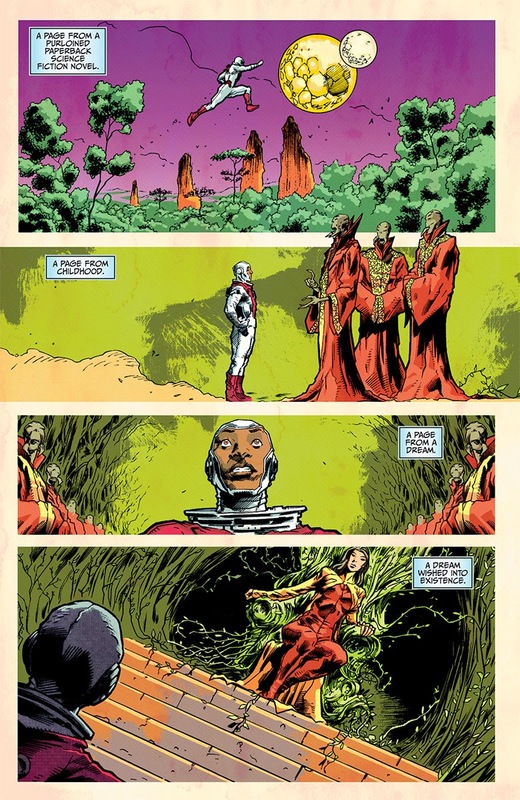 Kindt in particular has really carved out his own section in the Valiant universe, writing The Valiant, Unity, Rai, and now, with Trevor Hairsine on pencils, Divinity, an original book that brings a new character to this fast-growing superhero universe. The basic concept is pretty interesting: a Soviet cosmonaut is sent on a 30-year mission during the Cold War to the farthest reaches of our galaxy, only to mysteriously return in modern day with god-like powers. 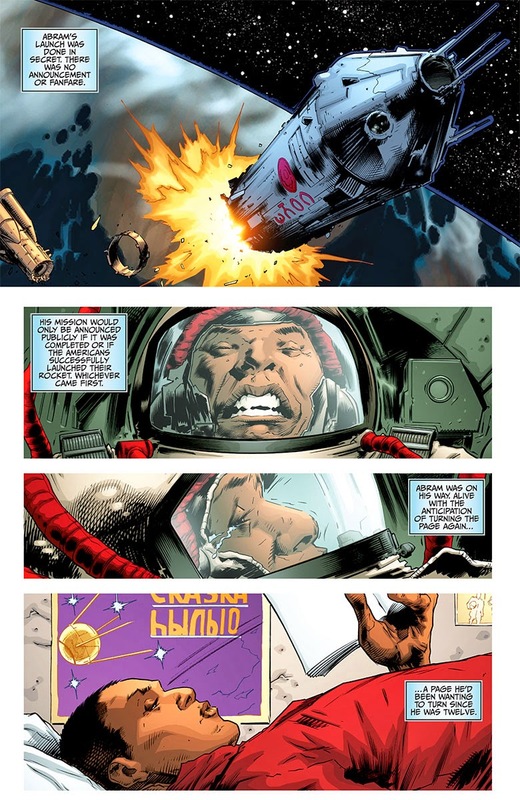 This allows for some potentially violent politicking between the communist god and the American military (and perhaps some of Valiant's other heroes), not to mention the obvious culture clash inherent in the man returning to earth after several decades archetype. However intriguing this all might be, it isn't wholly unfamiliar; what really makes this issue stand out, though, is the careful and complex style in which it is written. Kindt takes the approach of utilizing a great metaphor to both describe and tell the story: the idea that time is like a book, with pages that can be flipped between at will. There are obvious ties to the famous Watchmaker chapter of Watchmen, but it is used quite well in its own right here. It allows the narration to skip around, introducing both Abram Adams (the cosmonaut/god) and David Camp, who might be our POV in the modern era. This overarching metaphor works brilliantly as a storytelling device and adds meta-textual richness to the actual comic book readers will hold in their hands. It's worth noting, too, that while the issue primarily lays the foundation of the story rather than focusing on its characters, the pieces that build up Abram Adams are unique and allow for some subtlety that could really pay off down the line. I particularly like the fact that Adams is a person of color in an otherwise Caucasian group of scientists, students, and soldiers in Soviet Russia. This is obviously a conscious choice, especially interesting as we see the contrast between the racial riots in America on TV while Adams' comrades recommend him for the most important mission in their country's history without a second thought as to his race. The art by Trevor Hairsine, who has pencilled many issues of a variety of Valiant books, is mostly serviceable, but at times really shines. The talking heads pages where we see a bit of Adams' education are nothing special, but the more action packed pages–those with rockets taking off and of a wince-worthy rock climbing accident–pack a surprising gut punch. As we get a glimpse of the oddly beautiful powers of Adams returned to Earth at the end of the issue, I'll be interested to see how Kindt and Hairsine design future uses of this god's unique and terrible power set. Divinity doesn't pack the excitement of The Valiant, but what it lacks in epic superheroics it makes up for with fantastic writing. 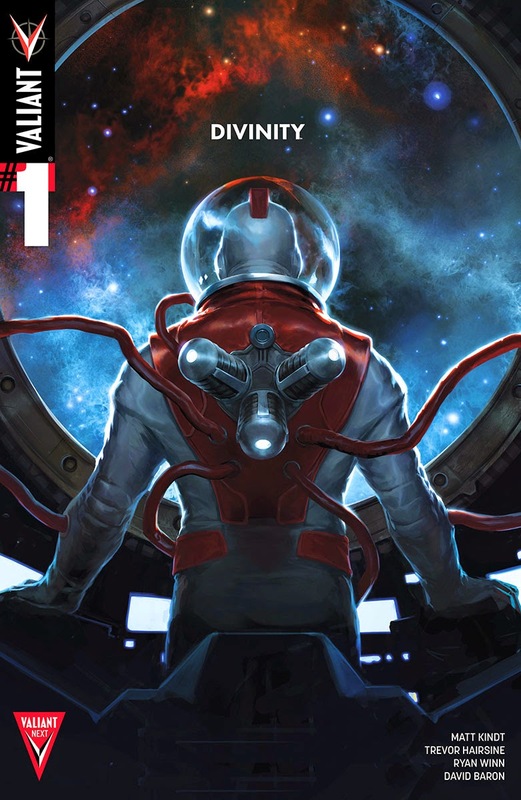 It's hard to tell whether the distinct style will continue with the book or whether it was just a great way to introduce the story, but either way Divinity is one to watch in an increasingly exciting line from Valiant Entertainment. Divinity #1 hits comic shops on Wednesday, February 11th.